The landing accident of US Air 1019 at Charlotte. More scenarios are currently being encoded and tested to be included in future releases of RealShear. The free demonstration version will run for 10 minutes and should allow for plenty of evaluation time before you will discover that this is a purchase well worth your (much appreciated) funds! Note that the historical shear events are not available in the free demo, but the 14 other and customisable scenarios are all available for you to test. This plugin requires PSX 10.0.5 beta 9 or later. Make sure you download the correct version from the following links. If you are running this on the same computer as PSX, then you will have the correct Java Runtime Environment (JRE) installed already and you can download the smaller setup program. If you do not have the JRE 1.7 or higher installed, or you don’t know, or you get an error running the smaller install saying no compatible JRE was found, and you don’t wish to install one from the web browser it opens for you automatically, you can select the “Standalone” download for Windows or OS X, which runs from a single executable. This does not install any runtime clutter in your system, it’s completely self contained (and thus will not be broken by other applications updating/upgrading/reinstalling/uninstalling your local JRE) – at the expense of just a few MB of disk space. There are four levels of licenses. Please read carefully which license is appropriate for you before purchasing your license. The standard, patron, and commercial editions are functionally identical, however, they differ in what scenarios you are allowed to use them in. Please note that there is no upgrade path! The license includes free upgrades both major and minor for the duration of the license validity which typically is 1 year from the date of purchase. This license is not valid for commercial use! Commercial use includes use at a simulator facility that is for rent/hire or for use at an airline training facility, or for any commercial training courses you or the organiser of the course are receiving financial benefit from. Note that when the software is run at one of those facilities, a commercial license is required regardless of whether you are actually using this software during training sessions. Your license is automatically generated and emailed to you on checkout. Please check your spam folder if you are not receiving your license within 5 minutes of placing the order. If you have not received your license in your spam folder or your inbox, please send an email to billing@inside.net indicating your name and email address you purchased the license under. You would start out by briefing yourself (or with your crew) what training scenarios you will be running. In this example we’re going to look at a non-predictive shear that triggers as the aircraft descends through 1200ft on the radio altimeter. The goal is to lose as little altitude as possible and to conduct a safe go around. An example layout if only one screen is available. We then want to set up the shear and vertical magnitudes. Open the “Shear / Microburst Parameters” panel and use the sliders to adjust the lateral shear (in windshear analysis circles we call that direction X) and the vertical shear (which we call Z). 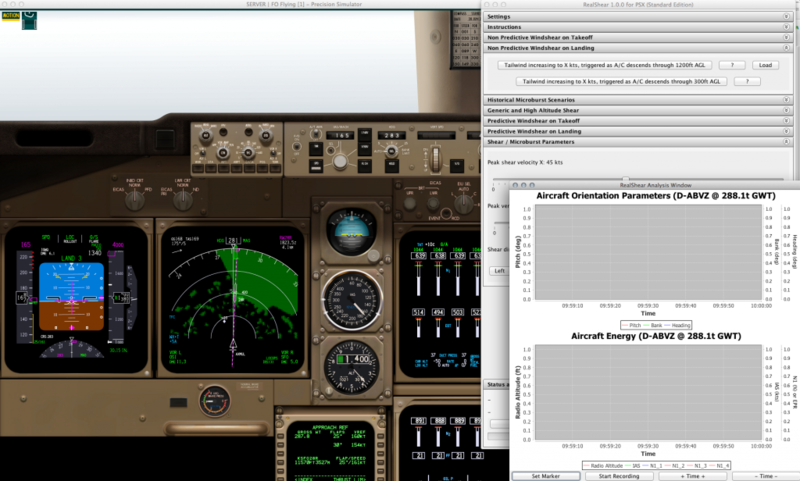 For this example we’re going to set X to 50kts and Z to about 2500fpm. Once these parameters are set, all that is left to do is to tell RealShear to go ahead and trigger the event and then unfreeze the PSX motion! So go ahead, click on the “Tailwind increasing to X kts, triggered as A/C descends through 1200ft AGL” button (this arms the event), then switch to PSX and press ‘m’ to unfreeze the motion freeze. Then switch back to RealShear and bring the analysis window into the foreground. You can either start recording on your own (in which case you also have to stop it on your own), or you can let RealShear start/stop the recording for the duration of the event. Then sit back and watch (and be ready to press TO/GA). After unfreezing the simulator, at the bottom of the screen you will now see the text “Waiting for activation criteria to be met: RA less than 1200”. This tells you when the windshear will activate. On the next line, the injection parameters are listed: If you want to change them now, you have to press “Abort this event” on the button that started it first, then change the values on the sliders, and then re-arm the event again. With the simulator frozen, we can look at the analysis plots in the RealShear window. We are shown two plots, one for the aircraft axis parameters and the other one showing all parameters that are important for managing aircraft energy. 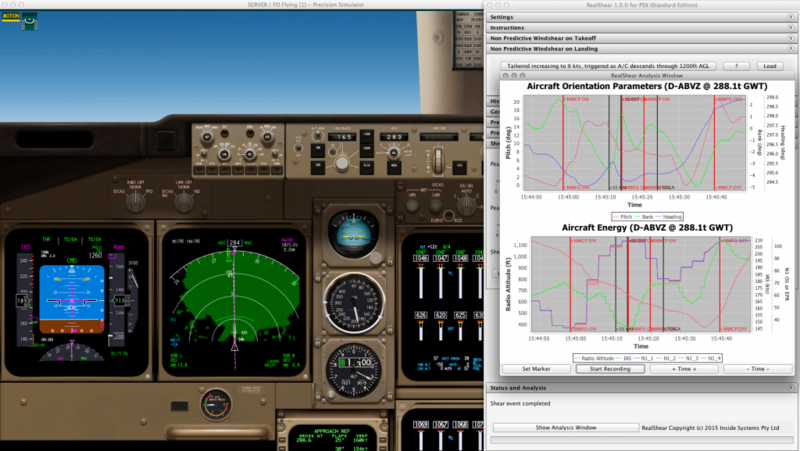 The detail plot showing aircraft energy management during a shear encounter. The aircraft orientation plot showing pitch, bank and heading. We can see the same vertical lines indicating events on this plot as well. We can see that from 15:45:10, the nose has been lowered continuously so as the stick shaker has warned us about the impending stall, we’re already pushing the nose over so as to gain speed. Not shown on this plot, at 15:45:00, the Captain and FO Master Warnings have been triggered (due to the windshear alarm). At 15:45:14 another warning triggers and we let another 10 seconds elapse until we press the TOGA button. It’s important to see that from the moment we press TOGA, it takes another 150ft in altitude and 8 seconds of time until a positive rate of climb can be established. How would that have turned out if we pressed TOGA sooner? How would it turn out if we had a higher speed to begin with? Using RealShear, you can examine an infinite number of possible scenarios for yourself. If you are a real world pilot, this will help with your understanding of kinetic energy management, and if you’re a playful amateur, you’re just going to have a lot of very interesting rides. Either way, we hope you enjoy this latest product!